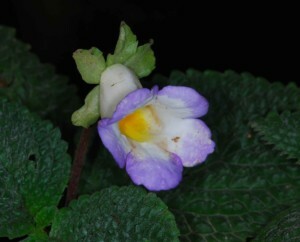 Nomopyle is a new genus created for two species, N. dodsonii (formerly Gloxinia dodsonii) and N. peruviana (formerly Niphaea peruviana) from Ecuador and Peru, respectively. Both species have fruits very similar to those of Monopyle and they are closely related to that genus. Only N. dodsonii is in cultivation. This species requires low light, high humidity and constant moisture. Like Moussonia, it is one of the few members of this subtribe without scaly rhizomes. It is not in wide cultivation.